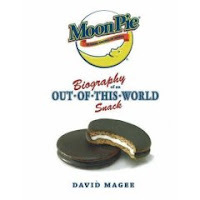 From the very moment that I learned of the publication of David Magee's MoonPie: Biography of an Out•Of•This•World Snack - I knew that I had to read it. I know, I know. I'm not normal. And whoever heard of a snack food with its own biography? But MoonPies are from East Tennessee, and so am I. So I had to read it. Now the trouble didn't begin with the book. No siree. The book is great. It's cute, well-researched, entertainingly written. It lovingly details the history of the original chocolate-covered graham cracker and marshmallow sandwich treat. I highly recommend it, if food biographies are your kind of thing. You know, even if they're not your kind of thing I'd still recommend it. It's a fast, fun little read. And it has recipes. That's right: r-e-c-i-p-e-s, people! And you've got to confess - doesn't some MoonPie ice cream, or a MoonPie Brownie sound pretty darn tasty??? So where did the trouble come in? My waking thoughts were filled with visions of MoonPie. This led to a Sunday afternoon trek to a Cracker Barrel. The less said about that, the better. Let's just say that even though I had not previously given a lot of thought to what hell would be like, my new personal vision has it looking a lot like a Cracker Barrel on a Sunday afternoon. Make that exactly like a Cracker Barrel on a Sunday afternoon. Anyhow - traumatic experience aside, I got a box of gorgeous lovely MoonPies. And one nice thing about the Cracker Barrel? They've got them packaged in a really cute retro-style box. But once I had my hard-won box of goodies - I found myself hesitating. Perhaps the actual MoonPie wouldn't live up to my expectations? Should the foodstuffs of our childhood memories should stay in our memories? The marriage of graham/marshmallow/chocolate was spot-on perfection. Every bite better than the one that preceded it. It was like eating happiness out of a crinkly cellophane wrapper. And that's where the trouble comes in. I seem to be unable to stop eating them. And my box is getting scarily low*. I need to get over this addiction, and quickly. Or else, I'm going to have to revisit Cracker Barrel. *Which is doubly scary - because I'm the only one in the house who will eat them. In fact, Schecky has none-too-quietly pronounced them "gross". Sweet Cracker Sandwich the MoonPie psycic connection Batman!! Alyssa and I were in one of the 2 eating establishments in LA (lower Autryville) waiting for our order and I noticed a box of Moon Pies. I told her all about how much you like MoonPies and that you even read the book on MoonPies but they weren't available in ATL. She said why don't you buy her a box and send to her. We had this converstion Saturaday. While we were in the midst of this conversation we see the lady behind the counter open a MoonPie, put in in a bowl and walk to the kitchen. Very curious we kept an eye on her. She microwaved the MP and then put vanilla ice cream on top. It's called a Space Mountain on the menu. Get it...moon- space... it took me a minute but I'm slow that way. Anyhoo this epic long comment was meant to say, a box will be on it's way. I don't think it's a super cute retro box though. Have you tried the yellow MoonPies. I'm not sure if they are vanilla or banana. Darn it I always proof read too late. Psychic. 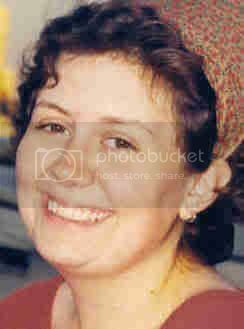 ah, my stepmonster use to love her moonpies. that and zero candy bars. I think I just licked my monitor. 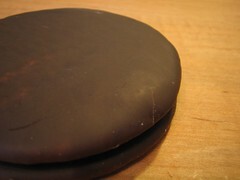 MoonPies rock. Oh my goodness! I had to laugh about the whole Cracker Barrel thing! Girl you should no better then to be anywhere near that place on a Sun afternoon! Hahahaha! Mmmmm Moon Pie!!!! Ya, wasn't your boy the one that willingly tried that unidentifiable produce from the grocery store a few months back?? Wait til you try the banana.. Call me crazy, but I'm not a fan of marshmallow things. 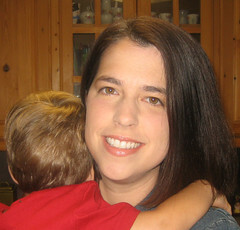 Now my kids on the other hand, I'm sure they could put those babies away! Never heard of them. But I'm a big fan of chocolate and marshmallows. So they must be good. Wow that takes me back. 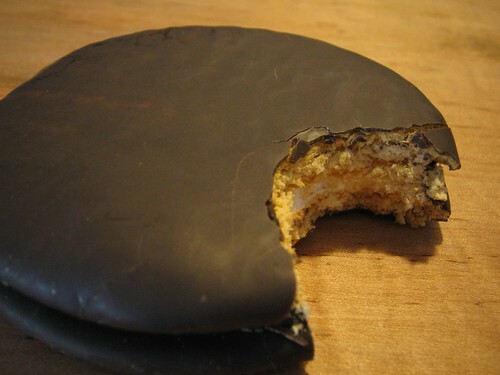 I loved moon pies so much that the guy stocking the vending machine at my frat house would make half of them cheap (to get me hooked), then the other half super expensive. What a jerk, but it was worth it. Thankfully my body doesn't like marshmallows (except dehydrated in cereal or hot cocoa, or a smore-but only one). But I am cracking up at your story. I think our family motto is the same, atleast in my husband's mind. He's the only man I've ever know who made corndogs from scratch. What is wrong with you! i'm on a diet you write about moon pies! I MUST have one now!!!! Never thought Moon Pies would cause so much commotion!! We're going camping next week and I've got all the fixins for s'mores. Now, I have to go searching for Moon Pies! Thanks for reminding me of how lovely they are. I suddenly have a hankering for a MOON PIE! I don't **love** them, but they are pretty tasty. 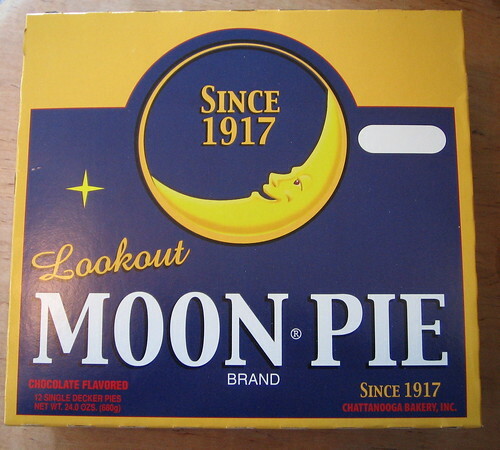 love the retro box of moonpies. and i'm so glad you got your MP fix, too. was worried about the CB venture. those can be deadly. 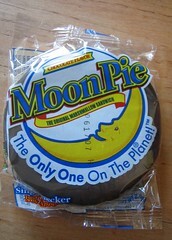 never was a big fan of the moon pie. but that's good cause it saves them all for you! happy moon pie in the sky!